Tracking poachers through the African bush is a bit different than following a set of hoofprints in the hope of spotting a kudu for a photo safari. To start with, kudus don’t carry AK47s. Nor are they likely to double back and set up a point ambush. 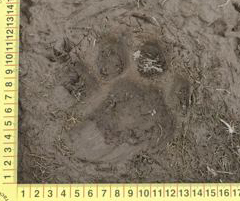 Whether you’re after man or beast, tracking is an intensely focused activity. Signs are usually faint and ambiguous—a partial print here, a scuff there. It’s like trying to assemble a jigsaw puzzle with half the pieces missing. A good tracker looks ahead frequently to infer in which direction his quarry is likely to have gone, but 90% of the time his attention is directed just a few feet ahead. And that can be hazardous if the quarry is a band of armed poachers. To improve game ranger success and personal safety, ConserVentures is working with the South Rift Game Scouts in Kenya to pay for and host a tactical tracking seminar in Kenya this October, as part of our Resources for Rangers program. Our team includes professional law enforcement officers for five days of intensive instruction. 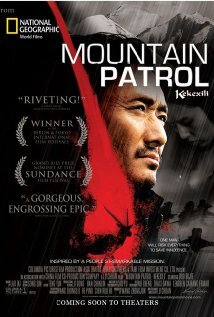 We had a chance to see the 2004 movie (part documentary) Mountain Patrol, about a small group of volunteer wildlife rangers trying to protect Tibetan antelopes in China. A very moving story, which illustrates very well the challenges faced by people trying to protect their natural and cultural heritage, in remote places, with little or no outside support. Sierra Designs tents has donated five Lightning XT 2- and 3-person tents for the wildlife rangers of the South Rift Game Scouts Association. Also on the way, due to the generosity of several other donors, are five Garmin GPSs and five waterproof Bushnell binoculars. We will be taking them to Kenya next week. This equipment will help the new scouts association in their mission to combat poaching of wildlife, and to continue their fieldwork gathering data and ensuring the safety of community members and tourists in the South Rift. Find out more about Resources for Rangers . 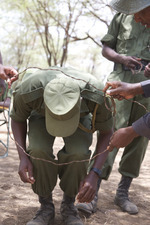 . .
Wildlife rangers provide vital anti-poaching patrols and community protection services for Kenya’s protected areas. The most successful units are founded and run out of Maasai communities surrounding the two most game-rich areas: Amboseli-Tsavo and the South Rift Valley. The new South Rift Game Scouts need equipment and uniforms—they receive no government funding, all support comes from the Maasai communities. They need GPS units, binoculars, tents, and uniforms and we'll take a load of gear on our September conservation expedition. Click here for details and to donate or shop for conservation now.